Whether you are new to Cardiff University or not. Progressing to postgraduate studies is a step-up. 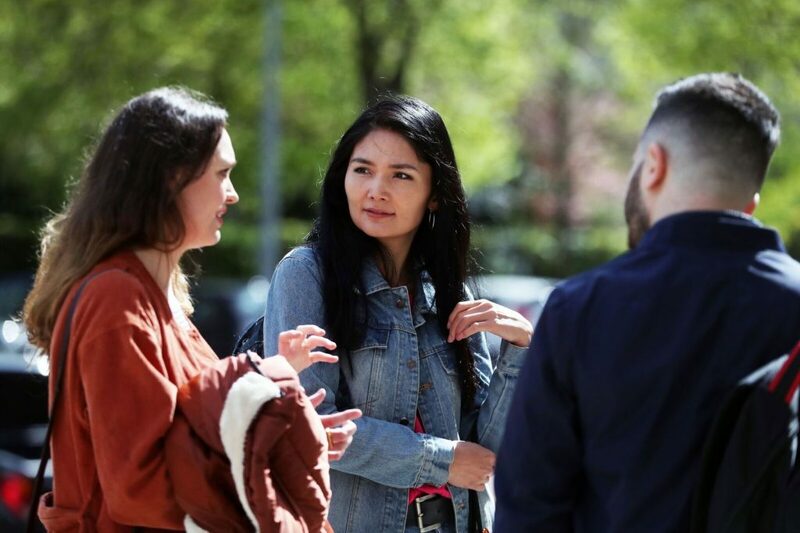 Some of our current postgraduates have outlined what they have found particularly different between their previous undergraduate studies and their current postgraduate studies at Cardiff University. There has definitely been a step up from undergraduate to postgraduate study. The work load can be challenging at times due to this step up, but it feels like a natural progression from undergraduate and not a huge difference from previous study. It is less the knowledge and techniques that are the step up from undergraduate but the work-load and what is expected of you for completing coursework in shorter time frames. Work load is similar but the time frame is shortened compared to undergraduate as there are only a few months to complete the taught part of the MRes course. However, it is easy to settle back into the rhythm of working this way and I am so glad that I chose to continue with my studies to the post graduate level. You are more involved with your tutors than you are during your undergraduate as there are fewer members of your cohort and therefore there is a lot more personal interaction with them, with more frequent meetings scheduled as a consequence. The MRes in Biosciences course is challenging but it is really worth it. The skills you gain in the taught modules within the first term are extremely beneficial when it comes to your six month research project. It ensures you don’t have to rely on your supervisors as much for taking you through certain methods during your project and ensures you have a solid, basic understanding of these areas before you have to apply them, and if you potentially have to use more advanced techniques during your project. I have also found that having training in these skills has been received very well when I have been applying for PhDs as not many candidates have the breadth and depth of training as you will have once you complete these modules. I highly recommend this course and I am extremely happy with the course and how I have performed and therefore I am very grateful to the staff at Cardiff for their expertise and support during my education here at the university. I’m finding postgraduate study to be much more enjoyable than undergraduate study because I’m genuinely interested in each of my modules, which generally wasn’t the case in undergraduate study. The workload is a little more intense because you need to do reading and studying outside of the classroom in order to do well. My course isn’t overly difficult, this may be because I’m interested and willing to learn what I’m being taught. The most difficult part is understanding the assessments that we’re given and what the lecturer actually requires from us. In undergraduate study I was given a lot of guidance on what was required in addition to a detailed assignment brief but postgraduate assignments require you to use your own initiative to determine what you think is relevant to the topic or not. We don’t have exams but have ‘class tests’ instead, these are so much more relaxed as they aren’t in huge rooms without people walking around and both of mine were invigilated by the lecturer so we had a familiar face in front of us. Class sizes are much smaller than in my undergraduate study, I much prefer this as we get the opportunity to really get to know each of our course mates and I’ve met some really great friends in the process. Because of the smaller classes we are getting much more interaction from the lecturers, each of them know our names and will happily set time aside for us should we need it. I may not be able to have the social life that I had in undergraduate study, although I still manage to have a night out from time to time, but I’m lucky that I’ve met a great bunch of people and we spend hours laughing together. For me, the personal tutor set-up is something I’ve never experienced, and the pastoral care has been second to none in Cardiff University. The workload is manageable and many people work part time, but you are a lot more responsible for your own research than in undergraduate study, so it’s important to get the balance right. Class sizes are much smaller, so it’s easy to get to know the entire class very well. I didn’t feel a big step up from my undergraduate to postgraduate study in terms of workload, to be honest. I think I spend roughly the same amount of time studying each week. However, there is definitely more independent study now. I have to consider what sources to consult as there is just not enough time to read every book and paper. I have a number of formative assessments this year, which I did not have during my undergraduate study. They are extremely helpful to preparation for the summative ones. I enjoy being a part of a small class, and I believe it’s much easier to make friends in a small class. Our lectures are also much more interactive than what I remember from my undergraduate years. There’s much more discussion and debate. My tutors are also quite helpful in terms of looking for jobs – they often guide us to relevant websites and organisations, which is also something new. My experience of postgraduate study thus far has differed greatly from my undergraduate experience. I am granted even more independence in conducting my studies. This is most pronounced in preparation for undertaking my research-based dissertation. We are referred to as ‘researchers’ rather than ‘students’ when we discuss this work. My research project (due in August) is 20,000 words. While this seems frighteningly big to me now, we are building up nicely to the project! My workload has increased exponentially. It is not unbearable by any means, but it has been a challenge to manage my time effectively. The deadlines for these assignments tend to be tightly bunched together. This means that prioritising tasks has been central to getting the best out of my work thus far. It is interesting that my assignments up until now have prioritised group work. This is probably more a representation of my course (MA International Public Relations and Global Communications Management) than it is of postgraduate study more generally. “I would say the main differences between undergraduate and postgraduate study often relate to issues of time management. Workload is fair but can be very demanding at times, and you would be surprised how much more time it takes to read around for seminars or prepare for presentations then you would at an undergraduate level! This trend is further evident in assessments-researching, writing and editing a Master’s essay can take more time and investment than the same process for undergraduate essays. However, this is made easier in that assessment at a postgraduate level is more flexible and can be tailored to suit your interests. This is reflected in my experience of my autumn assessments. Seminars are tailored to students interests and readings, and there is more engagement arguably because all your classmates are prepared to actually do the reading and take part in seminar discussion. Most class sizes are small, not topping more than fifteen in most of my assessments, a far cry from the usual twenty-forty in undergraduate lectures. Tutor interaction is also very helpful, as they not only engage in seminars but are also always happy to discuss assessment, reading or even advise you on the Master’s dissertation. Undertaking a Master’s degree can be quite a difficult endeavor, but I would offer three pieces of advice to help with the transition from undergraduate to postgraduate. Striving to be academically independent is a crucial element, as you cannot expect to be spoon-fed information by lecturers. Embark on the core reading and chase-up leads, and try to instill a unique and individual element into every piece of assessment you do if possible to maximize your grade and enjoyment of the course.